The collective presents ArtTripping, featuring day-long field trips to the picturesque museum. As part of their arts-in-education program, Sandbox Collective presents ArtTripping, featuring day-long field trips to meet artists and visit art spaces. The first trip was to Nrityagram in Hesarghatta.The second in the series will feature a very special excursion to the National Gallery of Modern Art (NGMA) Bengaluru, India’s premium museum for Indian art. Nestled in a beautiful garden spanning sprawling acres in the heart of the city, the museum houses traditional and contemporary Indian art works inside a restored beautiful 100 -year-old heritage mansion. 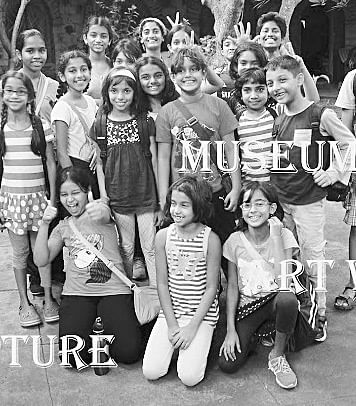 Sandbox has curated an exhilarating, fun, experiential trip at the museum for children to have a memorable day spent soaking in the world of traditional and contemporary Indian art with games and exercises thrown in-to make the visit interactive, interesting and fun. The day-trip includes a special guided gallery and sculpture walk, art sessions in the galleries, story-telling and theatre fun, a special exhibition centered on cricket followed by a series of internationally acclaimed animation short films. It also includes a picnic lunch under the magnificent old trees especially catered for us by Anju’s Cafe@NGMA. What: Nature and sculpture walk, guided gallery walk, art sessions, story telling, theatre fun and games and picnic lunch in the outdoors. sandbox@gmail.com or www.bookmyshow.com. Registrations close on August 15. To ensure that the experience is personal and intimate for each child, Sandbox has kept the numbers limited. This ArtTripping experience is open only to a maximum of 30 children on a first come first served basis.